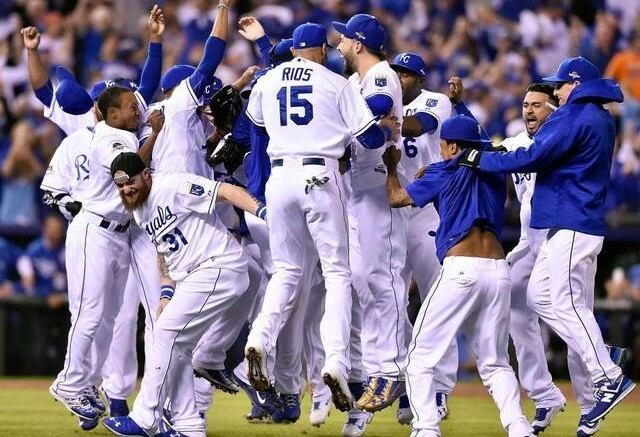 Will the Royals be celebrating after the World Series this time around? I’m honestly not sure what is more surprising: that the New York Mets are in the World Series, or that the Kansas City Royals are back in the World Series? The Mets hadn’t been to the dance since 2006, and now they’re in the Fall Classic, despite having the fewest wins among the five National League playoff teams. And in the American League, if anyone was primed to be a one-and-done fluke, it was the Royals, right? Not so fast. If you had told me back in April that a Missouri team would be facing a New York team in late October, I would have naturally assumed a Cardinals-Yankees showdown. Instead, the Royals and the Mets come in with similar storylines, a similar underdog feel, and similar styles of play. This should be a great series, but will it go seven, as last year’s Giants-Royals set did? The Mets’ offense was supposed to revolve around Yoenis Cespedes, but Daniel Murphy has stolen the show and then some, setting an MLB record by homering in six straight playoff games. Can he keep it up? Unlikely, but never say never. Lucas Duda showed signs of life in Game 4 to help cap a series in which the Mets never trailed, but can the Mets string hits together like Kansas City can? The Royals’ offense was jump-started by ALCS Alcides Escobar, who hit .478 with two doubles and a triple. One through nine, Kansas City’s lineup is deeper, even if the Mets may have a slight edge in power. Lorenzo Cain is another October stud who is right at the heart of KC’s deep run again, and Ben Zobrist and Eric Hosmer are dangerous. One big factor to keep an eye on will be in Games 3-5 at Citi Field, when the absence of the DH will leave Kendrys Morales on the bench. EDGE: ROYALS. The Royals are stout defensively, especially up the middle. Escobar has a cannon at shortstop, and this is where the loss of Ruben Tejada hurts a little more, even if Wilmer Flores is an offensive upgrade. Alex Gordon in left and Lorenzo Cain in center are as good as it gets. Yoenis Cespedes’ arm is second to none, and David Wright is solid at third. KC has a big edge at first base, where Eric Hosmer could be in line for his third consecutive Gold Glove award. EDGE: ROYALS. The easy and short answer is the Mets have a big edge here. They do, but Kansas City is getting surprising outings out of Edison Volquez and Yordano Ventura to help offset the major struggles of trade acquisition Johnny Cueto. But nothing really parallels the young, flame-throwing rotation of the Mets. Matt Harvey, Jacob deGrom, Noah Syndergaard, and Steven Matz have the ability to simply overpower a lineup. To be fair, Kansas City’s formula is a little different, because its bullpen depth allows its starters more rope, whereas the Mets needed their starters to get deeper into games. EDGE: METS. This, too, seems like a mismatch, but once again, both mismatches are kind of offset by the strengths of the other part of these teams’ pitching staffs. It’s fair to wonder who the Mets can rely on to bridge the gap to the untouchable Jeurys Familia if the starters can’t get deep, but the Royals have no such qualms. Wade Davis is lights-out as well, seamlessly stepping in after Greg Holland underwent Tommy John surgery. Addison Reed and Tyler Clippard are not the most reliable, while the Royals can turn it over to the ‘pen early with the likes of Luke Hochevar, Ryan Madson, and Kelvin Herrera waiting in the wings. EDGE: ROYALS. Hats off to Terry Collins, who I personally have admired for years, always citing the Mets’ overachieving ways even in prior years when they didn’t quite have the talent to compete. The Mets and Royals simply never quit and are as mentally tough as it gets, which means Royals manager Ned Yost is a much better skipper than the pundits were giving him credit for at this time last year. EDGE: EVEN. This is I think the tipping point in this series, the intangible factors. Home field advantage is a big deal for the Royals, who are awfully tough to beat at Kauffman Stadium (they are 11-3 since the start of last year’s postseason). The Mets struggled on the road in the regular season before turning it around in October, as they are 4-1 away from Citi Field in October. But really, the big intangible here is Kansas City’s “second chance” at the crown after coming up painfully short in Game 7 last year. After facing a four-run deficit and elimination in the eighth inning of Game 4 of the ALDS against Houston, the Royals have turned it on and not looked back. Texas missed its chance in 2011 after getting back, but this Royals team knows it may not get this chance again. The Mets’ layoff is of concern as well, as teams that have swept the LCS since it went to a seven-game series are 1-6 in the World Series, and eight of the last nine teams entering the World Series with the longer layoff of the two teams have lost. EDGE: ROYALS. Kansas City got second life after nearly being knocked out in Game 4 against Houston and this team is mentally stronger and deeper overall than the aforementioned Rangers team that couldn’t win it after getting back four years ago. The layoff should work against the Mets, and the Royals will become the first team in 26 years to win the World Series a year after losing it. PREDICTION: ROYALS IN 6. Be the first to comment on "2015 World Series Preview: Royals Out to Right Last Year’s Wrongs"